Headlines: Fishing has been very good and the lead up to the Christmas break is looking really good for a few Trout. We have continued to get some nice rain and the trout have been biting very well of late. All methods have been producing. Normal trading after this period. Hatches continue to be exceptional this week in many of the popular streams. The last two hours of daylight have been the most productive although you can get some nice fishing by searching during the day too. Many anglers have been leaving the water too early and missing out on some of the best fishing that can be had on our streams. Fishing right into the dark provides many more opportunities to cast at rising fish. Being on the water at first light is another key time. Best flies have been Adams parachutes, Klinkhammers, Blue wing olive parachutes, Elk Hair caddis and Beetle patterns, Wulff's and Humpies are good too at present. 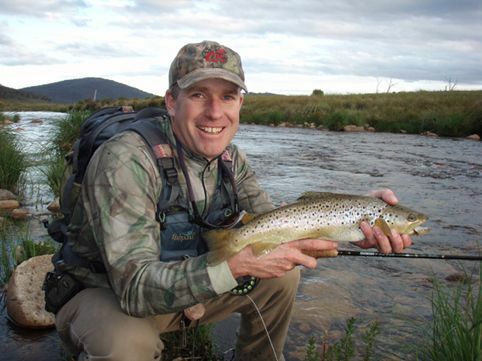 The Thredbo has produced some great fishing this week and also the Eucumbene. Small high mountains streams will be great as the weather warms up over the coming weeks. There are already numbers of hoppers around and with the huge amount of grasses growing the hoppers should do well. *Flylife Magazine photographer Brad Harris has had a couple of very productive sessions on the Thredbo, catching and releasing up to ten fish in a session. This was in the middle of the day also. *Had another top arvo session on the Eucumbene with two mates and between us we caught and released fifteen fish. Best was about 45 cm long and most were Browns. One of the fish landed below. 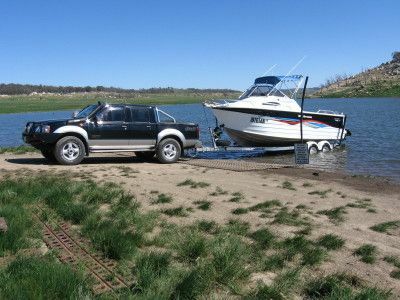 Lake Eucumbene:- Excellent fly reports from Eucumbene continue this week. Fish on midges and small wets have been common. The lake is looking fantastic at Buckenderra, Seven Gates, and Yens Bay with lush grassy bays and quite a few fish moving in them early and late. A Midge pupa, Stick caddis, or small Nymph fished with a slow twitchy retrieve will produce in these areas. A beetle pattern on wind lanes during the day is another successful method at this time of year. Woolly Buggers at other times of the day and especially off deeper rocky points can turn up some nice Browns. The lake level has fluctuated a little over the last 14 days but is on the rise again this week. *Fished Old Adaminaby with Sturg on Friday night for two small Browns, Sturg got a very long Brown which was a bit poor. All were released. There were good numbers of fish rising and quite a few Caddis, Midge and a few Tadpoles. Lake looks fantastic in some of the soaky corners with lots of grass and weed. Midge patterns and Craig's Nightime were the best patterns. 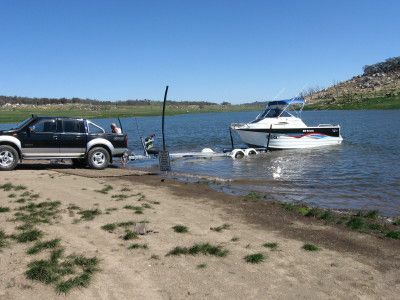 Lake Jindabyne:- There are still numbers of Midges hatching in Jindabyne. The lake is rising rapidly and flooding plenty of grassy bays. As the conditions warm there will be bigger hatches and plenty of fish rising. Reports suggest that the fish have slowed a little on the Midge but this will change when the weather warms again. 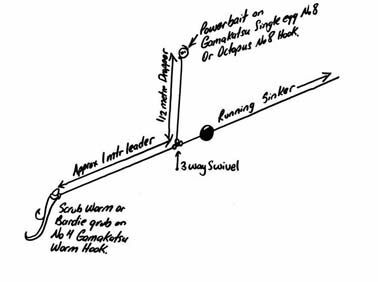 A Mudeye pattern after dark should turn up a few good fish as the full moon approaches. *Jimmy Savitsky from Canberra reports below. I tried Seven Gates from Thursday nite until Sat morn and while its pretty slow going and generally it was several hours between bites - I landed 8 rainbows from a pound to 750g so not a bad result. Michael from the store kindly allowed me to purchase some mudeyes over the phone and left them outside for me to pick up after you closed on Thurs but after all that I didn't get anything on the mudeyes! They would just sit under the float for hours without being touched, altho one dissapeared so maybe that was a hit. Thanks for that anyway very helpful service. All the fish were caught on Sherbet Gulp and Lime Twist powerbait. Anytime seemed to be a good time to catch a fish even got a nice one on Friday at 2pm. Casting only a short distance (5-8m) in very shallow water at night seemed to be the best method, I did hook some further out in deeper water at night too tho. Mudeye's should start to come on over the next few weeks also and the fish will start to get on them soon.